Ventilator/Respirator for general inhalation anesthesia with an endotracheal canula, specifically designed for use with mice, rats, and guinea pigs. The UNO ventilator is equipped with an anesthetic gas mixture connection, frequency, volume and max/min pressure controls. The system operates on a circle system, with the optional P.E.E.P. (positive end-expiratory pressure) setting. The ±80 cm tubing and endotracheal-canula connection allows for animal placement under a microscope, or in a stereotactic frame or water bath. Sinus pressure pattern following the natural breathing pattern of awake mice and rats (insp./expiration = 1:1). Because of the design of the unit, there is no danger of peak pressure in the lungs of the animals during ventilation (compared with valve operated ventilators). With extended gas supply- and gas exhaust tubing – the connection of the intubation tube is projected on a flexible supply- and exhaust tubing (which is part of the “Circle” system). The UNO Intubation Aid can be used prior to connecting the UMV-03. 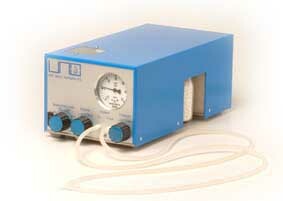 For UMV-03 setup, an artificial test lung is required.